Prices from £239 for a single to £467 for a super kingsize. £279 for the double seems like a bargain to me... good review too. Relax and enjoy a wonderful night's rest with the Silentnight Miracoil Divan Bed. 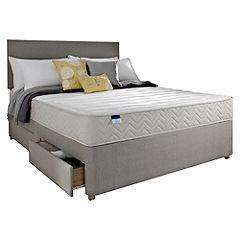 It features a mattress with breathable Eco-Comfort fibres to prevent overheating - keeping you cool while you sleep. The Miracoil spring system cleverly responds to your body weight and shape, ensuring even weight distribution and providing the correct amount of support needed. Instead of being compressed by your bodyweight, the coils respond to it and apply the correct amount of support - keeping you more comfortable. You can pick your choice of non-storage or two- or four-drawer models to perfectly suit your needs. Superking divan bed measures: 64.5x180x200cm. Mattress top material: 100% polyester. Please note that this bed comes fully assembled. It is your responsibility to ensure that any products you order will fit into the room or place for which the product is finally intended. Please ensure that you have measured the space required for this item, including all access routes. The bed does not include headboard, illustrated bedding or pillows. Comes with a five-year manufacturer's guarantee. Ive had one of these for the last 6 years fantastic beds. Gonna get myself a new one i think . Ta op. Cost me £380 when I bought mine and that was cheap!! Worst mattress in the market, we bought one of these a year ago and use it for a spare bed, I actually feel guilty about having guests sleep on it. It's rock solid! Worst mattress in the market, we bought one of these a year ago and use … Worst mattress in the market, we bought one of these a year ago and use it for a spare bed, I actually feel guilty about having guests sleep on it. It's rock solid! I have to agree with you there!!! Also use this voucher(DJXL-VJQD-FDV3) for another £20 off!!! Look at reviews on amazon of miracoil mattresses. They have good reviews from new buyers, but anyone that's had it for a year says it becomes terrible. Pocket springs are far better than these sort of springs....... you can get a 4' 6" double, 1000 pocket spring with memory foam for around £150 on Ebay. would I be better of with this one? ideally need it for tried to hlep with lower pack pain. sbfc - I too enjoy a firm mattress, however, as I said (and take this from someone that owns one) this is like sleeping on a slab of concrete. I firm mattress should still respect the curvature of your spine and body, this mattress assumes your spine and body is a straight line. Trust me, my £30 airbed provides a better night sleep. If it helps I sleep on one of these and couldn't give you enough superlatives to describe it, amazing night of sleep. Plus, let's be honest that's a hugely inflated RRP. you seem to know your beds hoff! what would you recommend and where from? i need to get a new one as mine has a few spots that droop causing me to sleep with a curved back, causing me loads of probelms. Correct singles start at £236 but double without storage is £299 not £350 take off the voucher code and it comes in at £279. Look at reviews on amazon of miracoil mattresses. They have good reviews … Look at reviews on amazon of miracoil mattresses. They have good reviews from new buyers, but anyone that's had it for a year says it becomes terrible. Yes, my firm miracoil-3 mattress has sunk in less than a year which is not good. My last bed lasted 20 years. I will be looking for a warranty replacement. you seem to know your beds hoff! what would you recommend and where from? … you seem to know your beds hoff! what would you recommend and where from? i need to get a new one as mine has a few spots that droop causing me to sleep with a curved back, causing me loads of probelms. No, I'm no bed expert I'm afraid, I'm just acutely aware through personal experience that this isn't a bed you'd want to sleep on daily. As I said previously, I can vouch for the comfort of the Laura Ashley mattress, it's far and away the best mattress I've owned. No, I'm no bed expert I'm afraid, I'm just acutely aware through personal … No, I'm no bed expert I'm afraid, I'm just acutely aware through personal experience that this isn't a bed you'd want to sleep on daily. As I said previously, I can vouch for the comfort of the Laura Ashley mattress, it's far and away the best mattress I've owned. i actually went and got this laura ashley mattress (king size), found a 10% off code and bought via quidco for a further £27 caskback. so should end up costing be £378. noly problem is the 12 week delivery time! Im tempted to buy this however i think the colour is described as mink but the pictures look more grey. Can anyone who has this describe the actual colour please? sbfc - I too enjoy a firm mattress, however, as I said (and take this … sbfc - I too enjoy a firm mattress, however, as I said (and take this from someone that owns one) this is like sleeping on a slab of concrete. I firm mattress should still respect the curvature of your spine and body, this mattress assumes your spine and body is a straight line.Trust me, my £30 airbed provides a better night sleep. If it helps I sleep on one of these and couldn't give you enough superlatives to describe it, amazing night of sleep. Great advice, shame about your name:) Just joking...well I have to say that Laura Ashley mattress looks pretty damn good but you obviously haven't tried one of these beauties Its a brilliant mattress, my sis has one and i slept on it the wk i stayed at hers, have not found a better one since! Got to say though, shame about the price! I so want one but its out of my budget, looking for recommendations, anyone? This probably won't get the heat it deserves. Have some on me. Great discounts, irrespective of the firm/soft argument. i actually went and got this laura ashley mattress (king size), found a … i actually went and got this laura ashley mattress (king size), found a 10% off code and bought via quidco for a further £27 caskback. so should end up costing be £378. noly problem is the 12 week delivery time! Which Laura Ashley mattress are you talking about? this one, but its up at £750 now. it was recommended on page one. Ah - thanks - I read page 1 but missed that little "these" link. Voucher code is not working....working for anyone else? Please do not waste your hard earnt cash on this mattress. Ours is now awful, only took a year, to become the most uncomfortable bed I have ever slept on. Save money in the long run and buy better quality to start with. Have to join in with the 'avoid' comments. We have had this mattress about 18 months and it is about to get sent to the tip. Absolutely dreadful. Was great to begin with but now I'd rather sleep on the sofa. With Silentnight mattresses, I'd recommend checking them out in Bensons or Dreams...etc. Make a note of the one you like then search for it online. You'll also note that the mattress name changes depending what store it is being sold in even though its exactly the same mattress. There may be a forum somwhere where people list the equivalent mattresses for each store and online shops. I never buy divan beds, a frame bed with legs stops spiders crawling up onto your duvet at night . I never buy divan beds, a frame bed with legs stops spiders crawling up … I never buy divan beds, a frame bed with legs stops spiders crawling up onto your duvet at night . spiders?? what do they do, keep you awake?? they crawl inside your mouth and down your throat. or they might lay eggs in your brain. Miracoil is just a fancy sounding marketing name for a very basic cage sprung mattress. What does "memory" mean in this case? they crawl inside your mouth and down your throat.ever wake up coughing? … they crawl inside your mouth and down your throat.ever wake up coughing? thats why!oOor they might lay eggs in your brain.one of the two. Have to join in with the 'avoid' comments. We have had this mattress … Have to join in with the 'avoid' comments. We have had this mattress about 18 months and it is about to get sent to the tip. Absolutely dreadful. Was great to begin with but now I'd rather sleep on the sofa. Another one here, we got one after getting it from a showroom. It was fantastic for about six months, then it got lumpy and finally ended up being so uncomfortable that we struggled to get to sleep. We now have a basic no-name pocket sprung mattress and it's infinitely better for about the same price. I agree with the criticisms. Withing a year the srpings were coming through and it wasn't even anymore. I say, don't purchase this. TBH, I would advise anyone in the market for a mattress to have a look at the website below; explodes a lot of marketing myths, provides a lot of knowledge for purchasing and save serious money in like-for-like quality. Very good testimonials also. If you don't want this exact colour then google "Silentnight Rio" for an entry level silent night bed that is well priced on other sites.